If you are lucky, once in a lifetime, a soul enters your life and touches you in such a way that you are never the same again. Such was the bond that began by a mud hut in Uganda. As I held her weathered brown hand, I promised the frail 100 year old woman that I would name my next “child” after her, then all too soon, I began a search for a dog who I hoped would embody her same wondrous soul. My sweet Arayo. After months of searching for the perfectly healthy dog with a temperament of gold, you climbed into my lap, and I knew my search was over. You had claimed me as yours and while everyone said “leave that dog alone” our hearts were already joined. For the next 11 1/2 years we moved through life in unison. Many came to know you through your health challenges, and you slowly won over even the toughest critics - those who said you would be nothing but heart break and expense. “I thought you were crazy, but now I understand,” even my vet admitted. As a Newfoundland supermodel, you tolerated hours in front of a camera, and became known across the globe through your line of cards and prints. 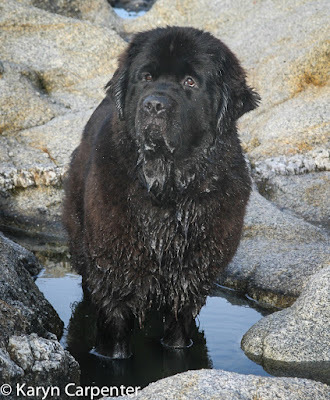 Trained for water rescue (the Newfoundland breed’s calling), you delighted swimmers, kayakers and even a stranded motor boat owner as you pulled them from the frigid Puget Sound waters. Together we sat with the dying, while you rested your big head on laps and I watched weary hands reach out to caress your soft fur. To a child, kidnapped by a parent and hidden away for years, unschooled - you offered weekly encouragement to learn to read. 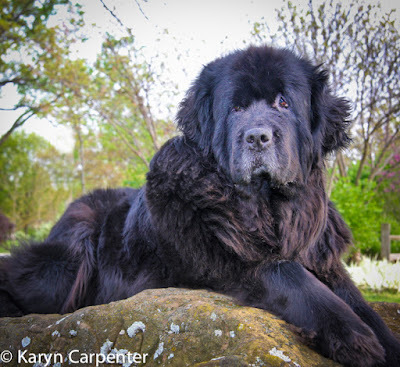 You brought joy to a little girl, upset over her parent’s divorce, and as the two of you worked to learn new skills, you were her teammate as she became the youngest person, at 10 years old, to put a new working title on a giant Newfoundland dog. As a friend to a crusty old sailor who had lost his hearing and eyesight, you offered a steading brace during hours spent on the docks as he relived long ago days spent at sea. Then came the day we packed our car and headed across the US and Canada, with just a tent, a camera and a blog. As word of your travels spread, for 6 months, people reached out, invited you into their homes and strangers became life-long friends. 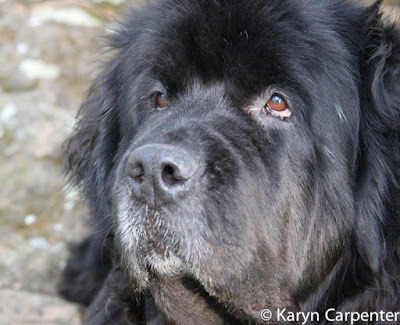 In Newfoundland, you patiently posed for hundreds of travelers and locals alike, who wanted a photo with a Newfoundland dog. Wonder filled the faces of young children, who had never seen a Newfoundland outside of a picture book. And on that long lonely stretch of road across the Province, an ambulance stopped, a side door opened and as you were motioned closer, I watched as the face of the patient inside was transformed by an enormous smile. Then, finally we traveled to be with my mother while her life was being claimed by cancer. Often, I’d hear her talking and discover you at her side, keeping her company in her final days. My sweet sweet Arayo. You were the one that was supposed to live forever, and, as a stranger wrote - if tears could heal, you would. Together we traveled so many roads, shared so many experiences, and met so many wonderful people. Because of you, my life has been far richer than I could ever have imagined. Karyn, I have some of your cards, and am a friend of Jacky Petrie; it was through her I found the link to your blog. This is breaking my heart. What a beautiful tribute to your beloved Arayo. We had two Newfs, the first year anniversary of the loss of our girl is coming up. There's nothing quite like the impression those giant paw prints leave on our hearts, and nothing quite like the feeling of loss. I wish you comfort on your grieving journey, Arayo has left quite a legacy. Thank you Elizabeth, for your kind thoughts. The loss of any companion is so hard, but when it is your heart dog, I am not sure I'll ever be over it. Our girl was my husband's heart dog; he says he never will be although coming up to one year, he's able to talk and laugh about her, a little more. I don't know if one "gets over" such profound losses, but we have found ways to live with it, to celebrate her life. I don't know you, but I am sure that you will find your path out of the darkness.